Additional Info: Fully double glazed and gas central heating.Patio doors lead out onto a seating area on our lovely veranda.A blue tooth speaker system located in the lounge ceiling.32” Tv with Blu Ray/DVD player. Electric fire fitted in the lounge .Fridge freezer,master bedroom with ensuite and dressing table/ wardrobe. 2 bedrooms with single beds and a further event with large shower cubicle. Some board games, books, DVD's, Iron,Ironing board, Hoover, mop/bucket ,dustpan & brush along with other cleaning materials.8 seater - Picnic bench to enjoy our large sunny patio. Available for following periods/bookings for 3 night’s (Fri - Mon), 4 night’s (Mon - Fri), 7 day’s & 14 days (Friday - Friday or Monday to Monday breaks for 2018 March to Nov 2018 Prices from £200 to £925 for a peak week in Summer. Payment for 3 & 4 day short breaks will need to be paid in full if booked within 4 weeks of arrival date. 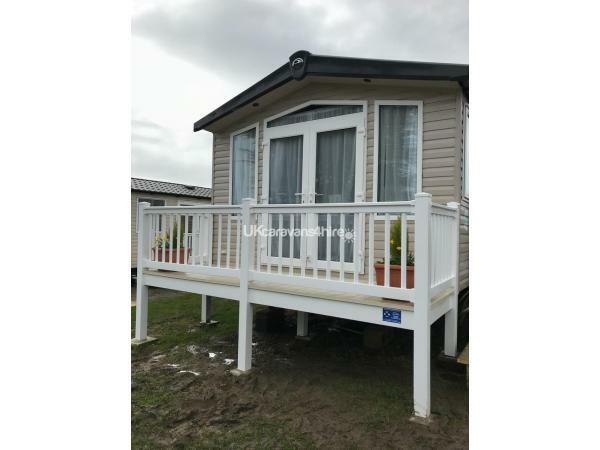 We require a non - refundable deposit of £50 to secure your short break or 20%for your 7/14 day holiday.The remaining balance to be paid 6 weeks before your arrival.In all instances a care and respect bond of £100 will need to be paid with the balance,provided all checks regarding condition of caravan are satisfied the bond will be returned within 7 days. Main named person making the booking must be aged 21 yrs or older in accordance with park rules.There must not be any over occupancy unless agreed by the owner beforehand. NO SMOKING, NO PETS, NO ALL MALE/FEMALE PARTIES ALLOWED. NO TRAILERS PERMITTED ON SITE.We also expect that you leave the caravan as you would wish to find it.Please check out park rules via the Haven website - as the above is only a small part.I do not accept responsibility arising from any issues concerning these as I expect all hirers to have read and accepted all park rules as I have advised. Please include your telephone number so I may contact you directly and discuss all details concerning the caravan. We have many positive reviews on other sites ,so please ask for details to be directed to these links if you require confirmation of a enjoyable and comfortable experience when booking with us.No holiday scams here,happy to be verified as a genuine owner,any questions - just ask ! Our caravan is ideally situated in one of Haven’s quieter and more scenic pitches although close enough to walk to the main complex or other nearby facilities of the park, also has lovely views of the hills & surrounding countryside. With only a ten minute walk to the beach. 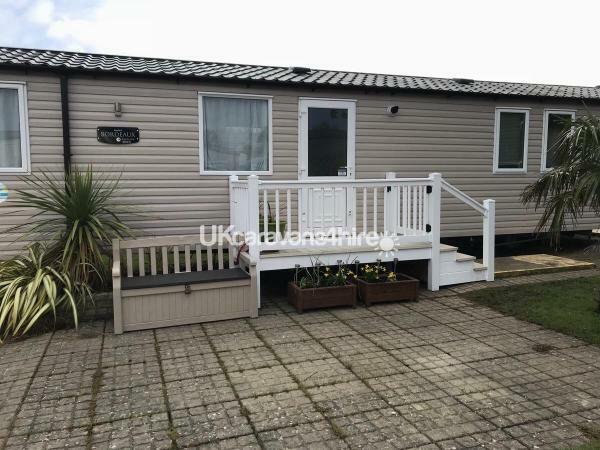 There is also a good sized patio area with a picnic bench outside the caravan and a private parking bay. It comprises of one double bedroom, two twin bedded rooms,a spacious lounge area.The main shower room has a large shower, WC and basin and there is a further WC with a hand basin. The kitchen is fully equipped with a full sized cooker, fridge/ freezer , microwave, 4 slice toaster, kettle,pots pans and crockery etc. Main living area has a 32" flat screen television with Freeview and a Blu Ray/DVD player with a selection of DVD’s. We supply duvets and pillows but you have to supply your own bed linen, towels, & tea towels.Bedding can be supplied if requested however a further charge for this service will be necessary dependent on party size. 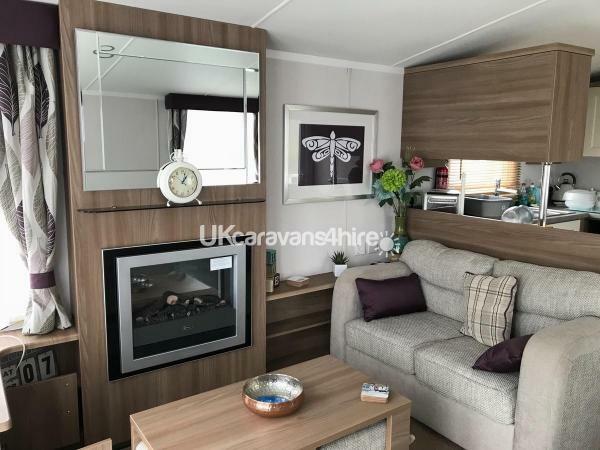 PLEASE NOTE: Short breaks deposit is £50,any stay longer than 4 days will require a 20% deposit.All breaks require a care bond of £100,returnable within 7 days - providing no damages,excessive cleaning or missing items from the caravan. Fun passes are NOT included in the price but can be bought on arrival at reception, passes allow you to use the facilities at Weymouth Bay and Seaview which include outdoor and indoor pools plus lazy river, full children's activity programmes and family entertainment plus a large range of outdoor activities are displayed in the reception area. You may hire linen packs from Haven in the region of £10.Additionally items such as high chairs,Travel cots & bedguards are also available to hire from Haven reception at an approximate cost of £7 per short booking or £12 per week. Because this caravan is double glazed and heated throughout it is ideal for your stay any time of year. 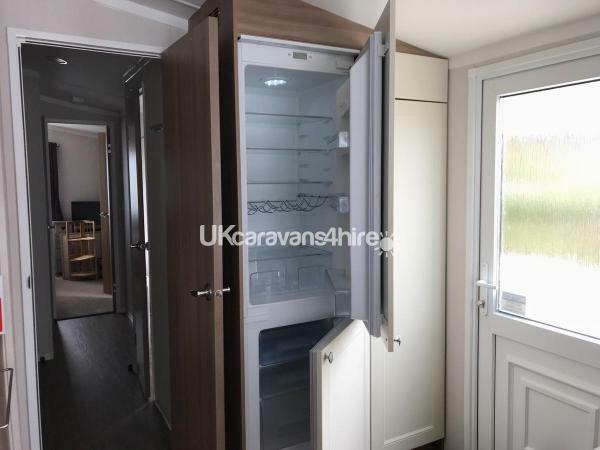 The caravan is fully compliant with Electrical/Gas safety regulations and is equipped with a number of smoke/carbon monoxide detectors and a fire extonguisher.Also has an intruder alarm, all for that added peace of mind. Additional Info: Amusement Arcade, Fishing, Putting Green, Pitch and Putt, Crazy Golf, Indoor Pool, Restaurant, Papa John's Pizza Takeaway, Grocery Shop, Laundrette, Kids Club.The Café Bar and Grill has a great range of real ales, draught lagers, snacks and meals.Diverse menu fishy favourites like the seafood mixed grill or keep the family smiling with an ice cream sundae or cake. The Haven amenities close on the 29th of October 2019 -March 2019 always lots going on in and around Weymouth. Alternatively off site there are 3 local pubs within walking distance 2 fish and chip shops and a bus stop outside the main entrance to the park - routes in to Weymouth usually run every 20 mins.Discounted entry to Sealife Centre and Weymouth eye via tickets purchased from Haven reception - please ask for details at Haven reception.